This overhead photograph shows NC State agricultural student scholars touring a tobacco factory. While the majority of winners are white males, some scholarship recipients were African American women and white women. Research Apprentices in the Field, 1981. These two pictures show the African American Research Apprentices in the field for their summer study. The students are interacting with farmers and potentially farming families or faculty. This lesson plan teaches high school students how to identify, analyze, and interpret primary sources such as textual documents, media, and oral histories. Teachers can use the lesson plan with primary sources of their choosing. Bulk Curing Simplifies Tobacco Mechanization, Paper No. 59-311, 1959. 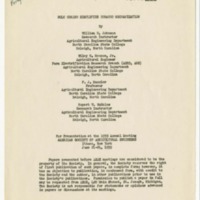 This report from the 1959 Annual Meeting for the American Society of Agricultural Engineers claims bulk curing simplifies tobacco mechanization. "What Is the Purpose of Education?" This infographic from the Association for Supervision and Curriculum Development (ASCD) explores the changing opinions about the purpose of education throughout the twentieth century by using quotes from various people during the times in question. "University Policy on Free Speech and Order"
In this speech, given by Chancellor John T. Caldwell, the chancellor encouraged students' free speech to the extent of the law, but reminded students to keep their demonstrations orderly and not disrupt the business of the university.